“I Want to be Like You” was my master’s thesis film made in the Experimental Animation program at California Institute of the Arts. It won a FOCUS national student film competition award and a silver medal at a German film festival. I don’t think stone sculpture was even a gleam in my eye at this very early time. Although I always picked up stones when I went hiking. I had a box labeled “Odds and Ends of Rocks and Gourds”. Hmmm . . . However, I see a link now between the little guy in this film and Disney and my sculpture. 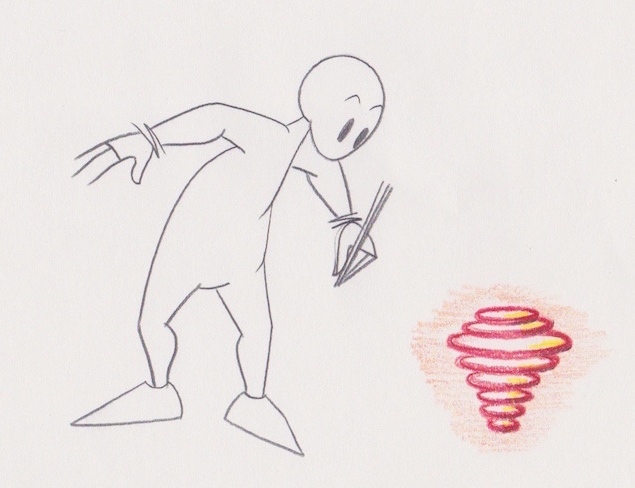 There is a climax in “I Want To Be Like You” where the character self-destructs and loses his pencil lines. This was fun for me because I wanted to know how many lines could be missing from the character and still be able to see the action. At Disney I studied lots of classic animation frame by frame. I noticed that the girl rabbit in “Bambi” had almost no interior lines. Yet her action still read. And, she was soft. In my new career as a stone sculptor I wanted to see if I could make hard stone feel soft to the eye. This was one of the inspirations for my snowshoe hare sculpture, “Big Feet“. I confess the finish on “Big Feet” is superlative and the stone actually feels soft along with looking soft.